Origin and Habitat: Hidalgo, Queretaro, Veracruz. 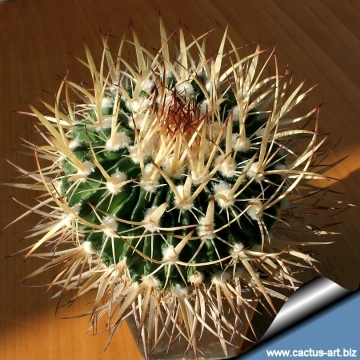 Description: Stenocactus lamellosus (Formerly known as Echinofossulocactus lamellosus) is one of the many geographical form of the widespread and morphologically variable Stenocactus crispatus. Many of its morphological and geographical variant was early classified as different independent species, but nowadays all this plant are considered part of a multiform species, where each form is linked to others by populations of plants with intermediate characteristics. 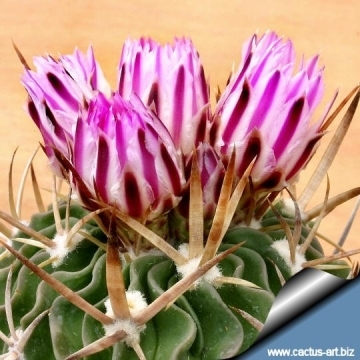 The name Stenocactus lamellosus is used to indicate plant crowded with very long flattened spines and many wavy ribs, but similar plants are commonly found in other populations and under other names, and to all intents and purposes it is a synonym of Stenocactus crispatus. 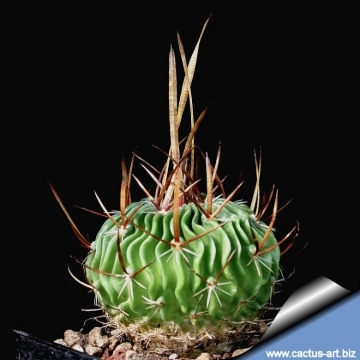 The plants in cultivation are quite variable. 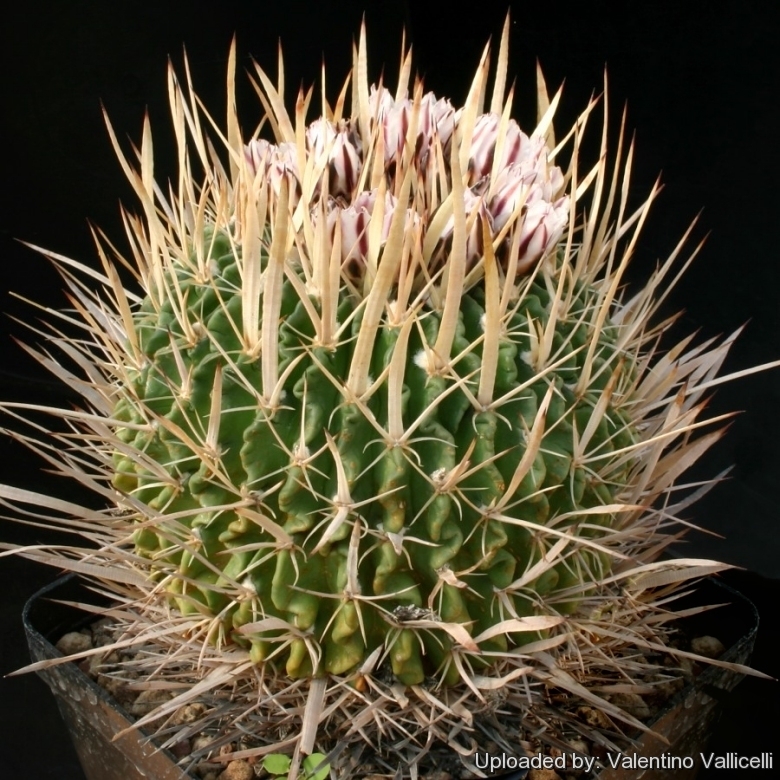 This is one of the Echinofossulocactus with the prettiest spination. Stem: Subglobose to sortly cylindrical, olive green, up to 20 cm tall, 8-10 cm wide. Apex usually slightly depressed. Ribs: ± 25-35, Thin, strongly flattened with very undulated or curled ridges. Areoles: Roundish, remote (only 1 to 3 per ribs), woolly when young. 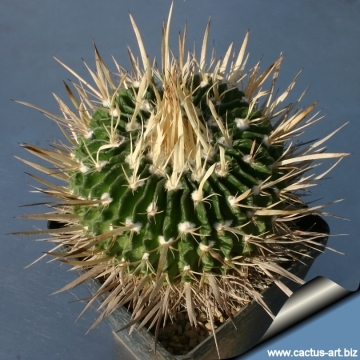 Central spines: Flattened, whitish to yellowish with brown tips,ferocious-looking with one very long (from 1 to 8 cm long) directed upwards. Radial spines: 5(-6) about 1 cm long. Flowers: Tubular to funnel shaped, 3,5-4 cm long, tepals linear to linear lanceolate, acute white to pink with a dark purple midrib. Stigma lobes 5-8, linear, yellow. Tube short and scaly. 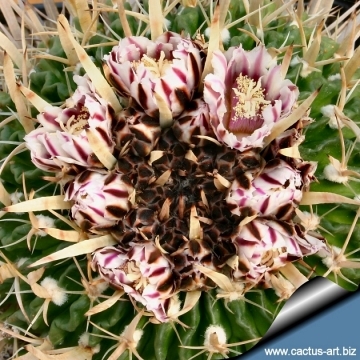 Cultivation and Propagation: Stenocactus lamellosus is easy to to care cactus, recommended for any collection that needs lots of light with ample airflow. Watering: Water regularly in summer, but do not overwater (very wet-sensitively, especially in light of its succulent root system), allow to dry between watering. Its roots are easily lost in pots that stay damp for any length of time. Watering should be curtailed during the winter months. In the rest period no high atmospheric humidity!! Care must be taken with watering as they tends to become swollen and untidy in growth habit if given too much water and shade. Propagation: Seeds (usually) or by the shoots of adult plants. Seeds germinate in 7-14 days at 21-27° C in spring, remove the glass cover gradually as the plants develops and keep ventilated, no full sun for young plants! The seedlings should not be disturbed until they are well rooted, after which they can be planted separately in small pots.